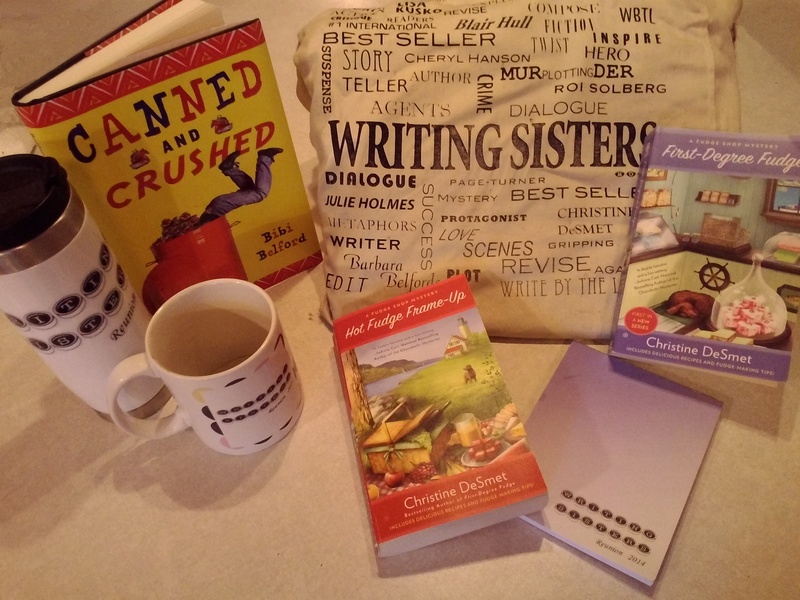 For Day Five, I had to shout-out to my Writing Sisters. Hey, gals! Three years ago, I signed up for the Write-By-The-Lake Retreat at the University of Wisconsin, Madison. It’s a week-long event that gives writers a week to focus only on their writing, whatever it may be. It was close enough I could drive there, and reasonable enough I was able to save up for it. It was a fork-in-the-road moment. I needed to get to the next level in my writing, and the Master Novel program seemed like the way to do it. The Master Novel class is taught by Christine DeSmet, and I’d read rave reviews about it. The class is limited to six writers and their complete novels. I signed up for a week of intense novel examination with five other women and a writing teacher with many years of experience. Little did any of us know that week would be the start of friendships that would continue for years. After three years, we are still cheerleaders for each other, offering encouragement when we lose our drive, ideas and suggestions when we run into a road block, and just all-around camaraderie. We all started in the Midwest, and now we’re scattered from Michigan to California, yet we manage to keep in touch. Treasure the connections you make with other writers. We’re a fickle, crazy, hermetic lot. I’ve met so many neat people in the past few years; the Internet is great for helping us get in touch with each other. To all the great writers I’ve met online–glad to have the chance to know you! I was nominated to take part in this photo challenge by Andrea Connolly, who shared wonderful images of the sea and sailing, along with great prose. Categories: Authors, Inspiration, Writing | Tags: challenge, five days, five photos, Inspiration, writers | Permalink. In the early summer, our grove around the farmstead is decorated by clumps of Dame’s Rocket. The fragrance of the flowers is so nice. It’s a lightly-sweet floral scent, not musky or perfumy. That, along with the pink–and sometimes white–flowers, brightens the shadows under the trees. They’re a sure sign spring is in full force and summer is on the way. 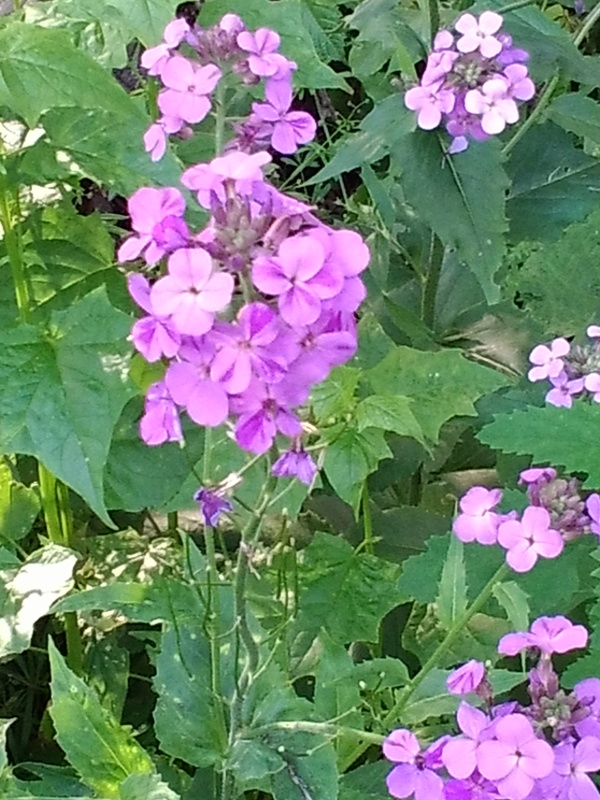 The Dame’s Rocket I see every day reminds me to pay attention. Not just observing things, but paying attention to things. Sure, I can see the flowers are blooming, but they smell great, and there are more white flowers in some areas than in others. I try to remember to pay attention whenever I’m out walking around. I suppose I should qualify what I’m paying attention to. I like to be aware of nature, and what is surrounding me in that realm. We have a wonderful walking trail accessible where I work. The path is paved, and meanders through a woodsy area preserved just outside a residential cluster of townhomes. I’ve seen many wildflowers bloom; I try to take pictures with my phone’s camera (crappy pics because I haven’t graduated to a smart phone yet) so I can look up the names of the flowers. One day was particularly fun. On my lunchtime walk, I saw a number of wildflowers blooming for the first time this spring. Even more interesting was the wildlife. Red-winged blackbirds always trill around the ponds. Baby garter snakes slithered away from their sunning spots. Along other ponds, Canada geese hung out with goslings, and I caught sight of the back end of a snapping turtle as it fled into the pond from its sunning perch. Farther along the path, I stopped. Two wild turkey hens were using the path in front of me. If you’ve never seen wild turkeys, trust me when I say they’re big. They were shy enough to refuse to stay put while I got my phone ready to take a picture. I hope you take the time to enjoy your surroundings. Nature is an excellent muse, and I’ve come up with some great solutions to dilemmas in my writing during my walks. Enjoy the outdoors, wherever you are! Categories: Inspiration, Writing | Tags: challenge, five days, five photos, Inspiration, muse | Permalink. My garden is a 75′ by 30′ affair, and in better shape this year than usual, due in large part to the favorable weather and loads of mulch. I’m always excited to watch things grow. 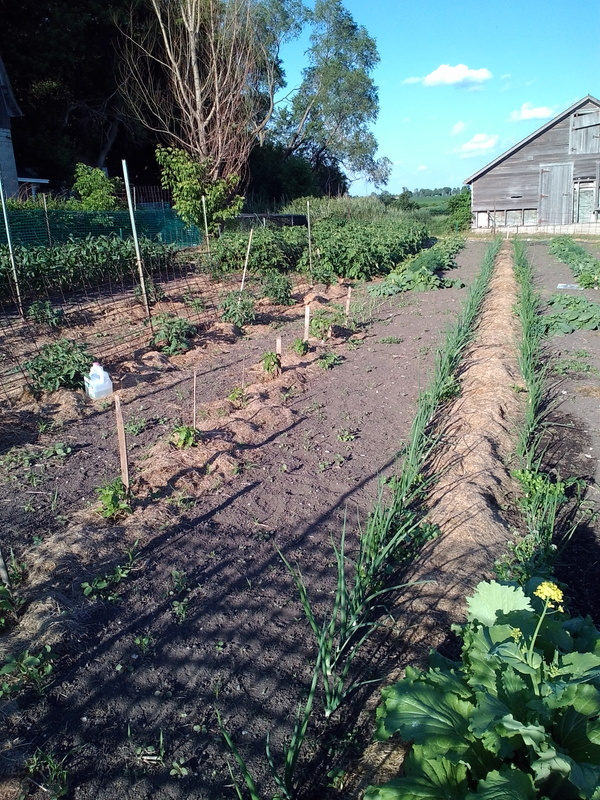 The onions are looking very nice, the potatoes are waist-high, and the corn is almost knee high. The weeds are amazingly under control for this time of the season (though we haven’t hit July yet, when the weeds get turbocharged). We’ve been eating radishes and spinach so far, and I’m waiting anxiously for the tomatoes. I love the first tomatoes–they taste sooo good! They’re even better since it’s been a year since the last garden-fresh tomatoes. Alas, the decent-looking, weeds-sort-of-under-control garden means my writing has suffered from lack of attention. I’m getting back to my WIP now, though. I need the first twenty to fifty pages ready to send to my writing sisters by next week, so they’ll have some time to look at them before our reunion in August. I had intended to do a smaller garden this year. Really. But a) our soaker hoses are 75′ long, b) we got a “new” tractor-mounted tiller my hubby loves to use, and c) we have to plant enough onions and potatoes to last most of the winter into spring. Yes, I know buying potatoes in the store is relatively cheap, but the ones you grow yourself taste better. We grow Yukon Gold potatoes, and try to use the leftover potatoes as the seeds for the current season. Last year we saved all the tiny, big-marble-sized potatoes just for the purpose of planting in the spring. We also used the potatoes that began to sprout. We don’t have the best location to store potatoes; ideally, a dark root cellar is the best place. Our unfinished, minimally-insulated basement is our option, and works well until about February, when the potatoes start to dream of growing into plants. I try to grow something new every year, so this year I planted kale. So far, it’s looking good. My sister-in-law asked me to plant parsnips for her, which I’ve never grown. So, two new things this year, along with trusty standbys like corn, green beans, cucumbers, Brussels sprouts, and beets. Crossing my fingers the watermelon will do well; it likes sandy soil, and I’ve got them planted in, well, not-sandy soil. We’ll see how it turns out. In any case, summer’s in full force. Hope you and yours are enjoying the season! Categories: gardening, Writing | Tags: challenge, five days, five photos, gardening, Inspiration | Permalink. Sooo love this! Thanks for sharing, D! Winter’s first snowfall is both welcome and dreaded. In MN, we can’t escape winter unless we leave the state. Some years we have brown winters, but we never escape the cold that comes with the season. I’m not one of those people who long for snow and cold so I can get out and enjoy it, but I appreciate the season for what it holds. Snow I’m okay with–there’s something about the peace and hushed silence that stirs up my creative energies. 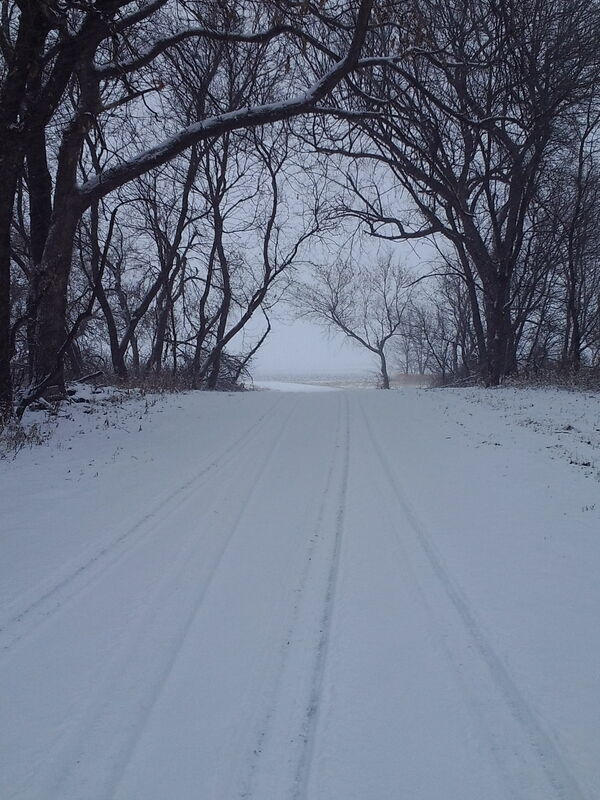 Even snowstorms are a muse for me, provided I don’t have to drive in them. The cold is something we have to get used to every year. There’s a strange difference between what the freezing temperature feels like after a month of autumn versus what it feels like after a month of below zero weather. Freezing feels cold in October, but balmy in February. Contrary to popular belief, Minnesota is not frigid all year. We get tropical heat in the summer–hot and humid with a generous dose of mosquitoes, and arctic cold in the winter, when you have to start your car at midnight and let it run for twenty minutes so you know it’ll start in the morning when you have to leave for work. My favorite part about winter is the time I have to write. There’s no garden to weed, no grass to mow, no tomatoes to can or cucumbers to pickle, and it’s too cold to enjoy being outside unless you dress like a tauntaun rider on Hoth. Fresh snow blankets the brown landscape left by autumn with a pristine white cloak that sparkles in the sunlight under skies so brilliantly blue it almost hurts to look at them. If we’re lucky, we wake up some mornings to trees coated with shards of hoarfrost, which is breathtaking to see, and an incredible muse. That first taste of winter, the smell of it, is somehow invigorating, though not as welcome as that first scent of spring, the hint of humus and spring rain. It’s the difference between knowing you’re in for months of snow and cold, or knowing the snow and cold will be going away soon and summer is on the horizon. Categories: Inspiration, Writing | Tags: challenge, five days, five photos, muse, seasons, writers | Permalink. First things first: Happy Father’s Day to all you fathers out there! When my aunt and uncle invited me to accompany my uncle’s choir group on a Sound of Music tour to Germany and Austria, I jumped at the chance. I’d never been out of the US except to Playa del Carmen and Cozumel, Mexico, on trips with my sister-in-law. I’ve always felt it was my responsibility to visit Germany at least once to honor my ancestry. The fact that the areas we were touring were Bavaria and the surrounding locales were a bonus. Bavaria is where Mad King Ludwig built his castles; I’d have the chance to see a number of them and others. Originally, castles were a way for a king to protect his land and his people. They had room for a small village, a way to survive sieges for a while, and defenses. The more “modern” castles seem more a way to show off how rich and important a person is (enter King Ludwig II). We toured Neuschwanstein, Nymphenburg, and Herrenchiemsee, as well as the Esterhazy Palace in Eisenstadt, Austria, and Mirabell Schloss in Salzburg. The thing is, those castles were built to be more family residence or government center than castle in the old-fashioned sense. My favorite part of the trip was our day in Salzburg. 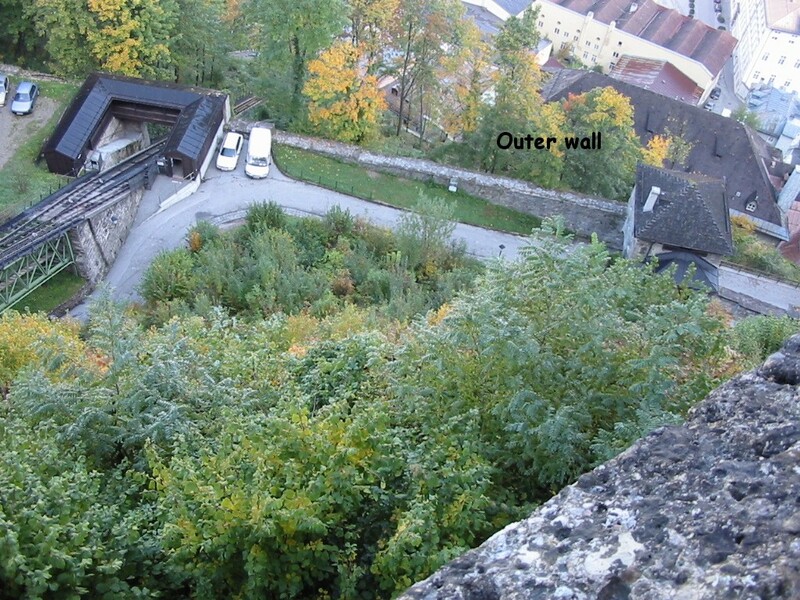 My favorite castle was the fortress on top of the “burg” overlooking the city–Hohensalzburg Fortress. “Burg” in German means “fortress”, or these days, “town or settlement”. Salzburg is up close and personal with a salt mine, which we also toured (way cool!). So, Salzburg is the fortified settlement on a salt mine. Hohensalzburg is the fortress high (hohen) over the town. And get this–it’s a real castle overlooking the city, complete with inner and outer walls, a portcullis, cannons, a whole village inside the walls, and even a well to provide the residents with water during a siege. The path to the gate is via a steep cogwheel train. All the fantasy books I’d read that incorporated castles of some sort now had more substance in my mind. I could picture the relative size and layout of a castle built for defense. Hohensalzburg is more “real” castle than Neuschwanstien could ever hope to be. The thing I remember most about that trip is the sheer amount of history. The United States is pretty young in the grand scheme of things. In the Midwest, if something is a couple hundred years old, then wow, it’s old. On the East Coast, where the first thirteen colonies put stakes in the ground, that extends a little bit more, to maybe three or four hundred years. In Europe, four hundred years is a drop in the relative age bucket. We saw the oldest restaurant in Europe: Stiftskeller St. Peter in Salzburg. Get this: established in 803. Didn’t eat there, but the Roman legions did. Someday I will go back to Europe, but maybe to Ireland first, then the UK, then Iceland, then the rest of my list, including a must-do-it return to Salzburg and Bavaria. My family’s ancestral farm still exists in northern Germany, and I think it’d be cool to see that. So ends Day One of the Five Day Challenge. Now off to pull some weeds before I put together tomorrow’s post. I was nominated to take part in this photo challenge by Andrea Connolly, who shared wonderful images of the sea and sailing, along with great prose. I would like to nominate Mae Clair, whom I know is on a book tour right now for her new release, Myth and Magic, but I hope she can find some time to pick up the challenge (besides, she just tagged me for a different challenge 🙂 ). Categories: Authors, Inspiration, Writing | Tags: challenge, five days, five photos, writers | Permalink. I was tagged by Mae Clair, who is currently on a blog tour promoting her new book, Myth and Magic. Check out her blog. She does a fun Mythic Monday post every week that stirs up the creative juices. She’s one of the great people I’ve met since I started participating in the writers’ realm. I’ve been writing for years, and the Internet is a wonderful medium for meeting other writers, especially when one can’t attend other writerly gatherings like conferences or workshops. 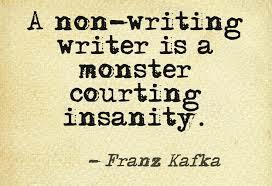 Categories: NaNoWriMo, Writing | Tags: challenge, creativity, nanowrimo, writers | Permalink.